Releases from Packard Bell were initially fairly infrequent following its acquisition by Acer in 2008, but this has changed over the past few months. The latest release, the EasyNote TJ65-AU- 052UK, is a highly portable yet low-powered consumer machine. Although it is not the smallest laptop you can buy at this price, the 2.7kg chassis provides adequate mobility for short journeys and use around the home. This is helped by the excellent 244-minute battery life, keeping you juiced up while on the go. Unfortunately, performance is less impressive. The dual-core Intel Pentium processor is a low-powered variant and provides adequate performance. 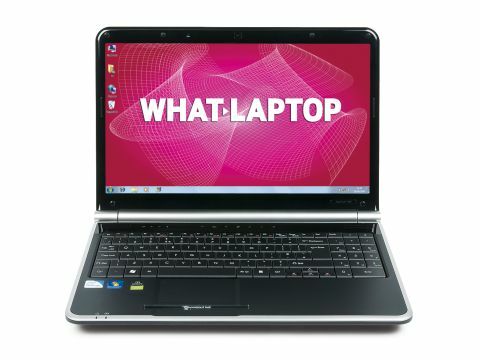 While it suits basic home office use, it cannot hope to match the abilities of the Dell Inspiron 1546 and Samsung R580. Graphics performance is equally limited. The integrated Intel graphics card provides only enough power for occasional photo and video editing and watching DVDs. More pleasingly, an HDMI port is in place for connecting to an HDTV. The laptop's own 15.6-inch screen is excellent. While it's not as bright as we would have liked, colour and contrast are both strong and create vibrant, if a little dim, images. The glossy Super-TFT coating is also one of the least reflective we've seen, making it easy to view. Of course, any machine is useless without a good user interface and the EasyNote TJ65-AU-052UK delivers here. While the keyboard unfortunately doesn't span the full width of the chassis, the tapered keys are large and accessible, making typing a pleasure at all times. The black/silver chassis design isn't the most stylish we've seen, but it creates a sleek look for the home or office. The chassis also feels pleasingly resilient throughout and is sure to take the knocks of regular family use. Although storage is bettered by three rivals, the 320GB hard drive will prove ample for most users. Also, a strong level of compatibility with flash storage cards is provided by the built-in 5-in-1 card reader, making it easy to share files with your phone and camera. Equally useful for the home or office is the high-speed 802.11n Wi-Fi and Gigabit Ethernet connectivity on offer. Unfortunately, Bluetooth is not included for short-range wireless data transfers. Although the EasyNote TJ65-AU-052UK is a usable and likeable machine, its limited power makes it tough to recommend it against its rivals, and you will find you get more for your money with the Samsung R580 and Dell Inspiron 1564.